My family eats a lot of peanut butter. We like it on toast in the morning, as a snack with apple slices, and in the always favorite, PBJ. Last fall the news reported that a shortage of peanut butter would reach the consumer by December. The price of peanut butter spiked this past year. In October, I was paying $1.79 for a 16 oz. jar of natural peanut butter at Trader Joe's. Now in early May, it's $2.79 per jar. Needing a less expensive, but equally nutritious alternative, I thought about making my own nut butter. Many years ago I experimented with making my own peanut butter, so doing it again would not be much of a stretch for me. Trader Joe's has reliably good prices on nuts and seeds, so I checked here for my ingredients. As it turns out, sunflower seeds are the least expensive nut or seed. And as luck would have it, because of their small size, they process into butter fairly easily. Sunflower seeds were $1.99 for a 16 oz. bag. Adding in canola oil and brown sugar, my sun butter had a total cost of $2.25 for 20 oz. (or $1.80 for 16 oz. -- just about what I was paying for peanut butter before the price went up). The whole process took 35 minutes. 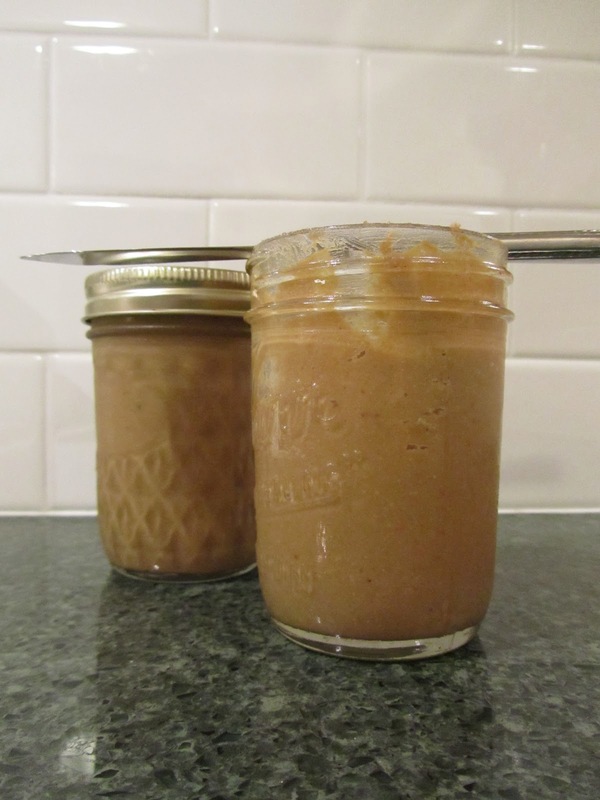 Here is how my foray into making my nut/seed butter went. I used my 31 year old blender for the job. It can crush ice so I figured it could also crush the sunflower seeds. It's not a true grinder, so the sunflower butter isn't as smooth as Jif creamy peanut butter. (You won't fool the kids into thinking this is their usual PBJ.) If you usually eat natural peanut butter, this will be similar. Begin by processing the sunflower seeds into meal, 1/4 at a time, emptying into the large bowl. This goes quickly, and needn't be perfectly uniform at this point. Stir the mixture from time to time. Pulse your machine, do not run continuously -- you could burn out your motor. If at any time the motor housing begins to feel hot, stop the machine and allow to cool. My machine never did. I tried to be careful about overheating. Now, scoop 1/4 of the meal into the small bowl. Microwave for 25 seconds. Add 2 Tablespoons of oil to the blender, along with 1/2 teaspoon of brown sugar. Dump in warmed meal. Process until smooth. (Blend on Medium for about 20 seconds at a time, stirring up from the bottom between pulses. Towards the end the meal will begin to become smoother. At the very end, process on High, until desired consistency, for 45-60 seconds at a time.) Scoop into canning jar. Repeat this process until sunflower meal is all used. 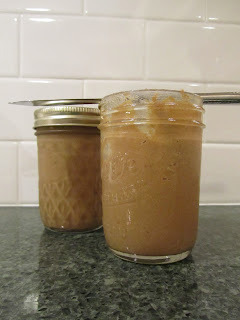 Note: I had about 3 Tablespoons leftover sunflower butter in blender after filling 2 jars. Not wanting to waste even a bit, I used this sun butter to make a smoothie for my lunch, with milk, 1/2 a banana, ice cubes, sugar and vanilla. Your interest may not be in saving money on peanut butter. Instead, you may be dealing with peanut allergies in your family, or have restrictions in place at the local school prohibiting peanut products packed in lunches. Here is a delicious alternative. Sunflower seed butter sold at Trader Joe's is priced at $4.99 for 16 oz. Homemade cost me $2.25 for 20 oz. Even cheaper version of sunflower seed butter!In early May (May 9, 2012), I posted a play by play of my foray into making my own sunseed butter. Here's an update --it's even cheaper! By finding raw sunflower seeds for less $ per pound, my sunseed butter came to about $1.40 for a 16 oz. jar, after costing in the added oil and brown sugar. I was at Fred Meyer's in their nutrition/bulk foods section. Their hulled, unroasted sunflower seeds were $1.49/lb (50 cents/lb. cheaper than Trader Joe's roasted sunflower seeds!) I bought a pound, knowing I would have to roast and salt them myself. No biggie. On the stovetop, in a non-stick skillet, over Medium flame, with 1 teaspoon oil added, I roasted while stirring, the entire pound, for 10 minutes. I added 1/4 teaspoon salt and tossed well. Overall, they were a nice golden brown when finished. I then proceeded with the recipe from May 9th post, above. Even with roasting the seeds on the stove for 10 minutes, it still took just about 30 minutes total. I was more familiar with what to do this time, and streamlined the process a bit, by measuring out the oil and brown sugar all at one time, and eyeballing each addition. Just an FYI -- natural peanut butter is selling for $2.79 / 16 oz. at Trader Joe's. This natural sunflower seed butter cost me $1.40 / 16 oz. -- that's about half price! !